Tis' the season to be .. generous! These two items are great and they could be yours! Be sure to enter below! The Chef'n pull'n slice mandoline. Chef'n has wonderful products for the kitchen and this is one of them. 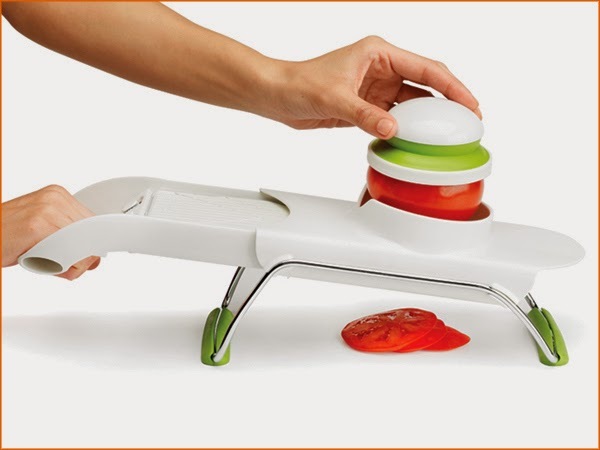 This mandoline definitely comes in handy when it comes to slicing any vegetable. I mostly use it to slice potatoes for an au gratin, zucchinis, onions for homemade onion rings, and much more. It saves me so much time and accuracy! I have an obsession with serveware. I spend most of my time in stores checking out all the creative ideas companies have come up with. 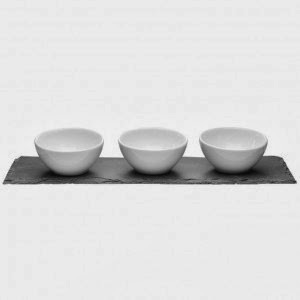 This 4-piece serveware set comes with three white ceramic bowls and one slate tray. This serving set could be used for salsas, fruits, nuts, cheeses, condiments (I use when making tacos - lettuce, tomatoes and cheese! ), and so much more. The slate tray is unique and beautiful. I love using this same set when guests are over! Wishing you much love and happiness this holiday season. Good luck! - from Me, Charlie, Allegra and Willow! All I want is a new Driver to add to my Golf set!!! I need some brown slacks. i just want my kids to have a good christmas! I would love a new slow cooker this year! Number one on my xmas list is a ps4! I just want to be with my family, and make sure I can help as many family's as I can! I would like a new food processor. A Kindle Fire is #1 on my Christmas list.